On 22 January 2007, our research project will be hosting a free workshop for the Centre for Antiquity and the Middle Ages, University of Southampton on: ‘Labels that Stick: early medieval people and objects and the problem of description’ with keynote speaker, Professor Bonnie Effros (SUNY, Binghamton). This year the Theoretical Archaeology Group (TAG) is holding its annual conference in Exeter (X-TAG) on 15-17 December 2006. I am organising a session called ‘ ‘The spade cannot lie’ – fresh perspectives on medieval material culture’. The session abstract is reproduced below. Please email me if you would like to give a paper, participate in the discussion afterwards or are interested in the creation of a Medieval Material Culture Communication Network. A group of postgraduates from the Faculty of Law, Arts and Social Sciences at the University of Southampton (which includes the School of Humanities) has established a network for research into the Construction of Identity as it relates to our various disciplines. I have been involved in the early stages of this group and we have set up a community weblog on the academically based ‘elgg.net‘ site. As a group we aim to compare our various experiences of understanding how identities are constructed and what problems we have in common when trying examine issues of identity in our fields of study. The community weblog will be on trial during the month of June and then formally launched to the world. The second most immediate aim is to compile a cross-disciplinary bibliography of titles we have used in our various fields and make this available via our community weblog. There has already been significant interest in this network from academics and postgraduates from within and outside the faculty. Please add a comment below if you are interested in find out more. 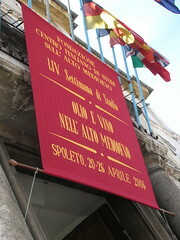 The 54th Settimana di studio (study week conference), hosted by the Centro Italiano di Studi sull’Alto Medioevo (CISAM) was themed ‘Oil and Wine in the High Middle Ages‘ and took place in the beautiful medieval town of Spoleto, Umbria (20-26 April 2006). I was fortunate to have won one of the borsa di studio awarded to ‘foreign’ students. The majority of the Settimana took place in the Palazzo Ancaiani where CISAM are based. The conference itself was highly varied with papers ranging from the theraputic use of oil and wine (Jacquart), to oil and and wine in Byzantine liturgy (Parenti). Next week, Birkbeck College (University of London) will be hosting an exciting conference called: Past Presented: Uses of the Past in Medieval European, Byzantine and Islamic Material Culture on 23 – 24 March 2006. The themes of the confernce are: ‘Identification’, ‘Topography’, ‘Constructing’ and ‘Inventing’. See the preliminary programme for details of the papers that will be given. Following the publication of Y. Hen and M. Innes (eds.) 2000, The Uses of the Past in the Early Middle Ages (Cambridge: CUP) which primarily deals with the evidence from documentary sources, this conference will hopefully fill many ‘gaps’ in our knowledge of the uses and understanding of the past and demonstrate the crucial value of material culture (in all its various guises) in all aspects of medieval studies. Both of us intend to attend and participate in this event.